Occupying the western extremity of the North Island and the lower central region below Taupo, Taranaki and the Whanaganui-Manawatu regions are packed with gloriously beautiful landscapes of rivers, forests, ocean, gorges, mountains and a 101 activities connected to each of these geological features. The area is bursting with cultural and historical interest too, painted in equal parts by both its Maori and pioneering European settler past; the story of one such period in time can be learned by riding along the mysterious Forgotten World Highway. Maori legends abound; one such tells us how Mt Taranaki – the huge almost perfectly conical volcano which dominates this landscape – once lived harmoniously with the North Island's other volcanoes of the Central Plateau but had to flee west after a bloody battle with Tongariro over the (female) Mount Pihanga. Most journeys in this region will involve at least one ride along State Highway 45 – more fondly known as the 'Surf Highway' – which, curving along the coast, makes stopping off at any number of beaches not just super easy but almost compulsory. Aside from the dramatic coastline favoured by the surfing fraternity, adventure and thrill seekers are well-catered for in general - bungee jumps, river gorge jet-boating, diving and white-water rafting plus oh-so-much-more are all up for grabs including an only-found-in-Taranaki option – dam dropping. A wealth of discoveries to be made on land, water – both salt and fresh - and even in the air in these parts are almost guaranteed to appeal over and again to the traveller while New Plymouth, with its plethora of freebies, festivals and overall artsy air, attracts a steady stream of backpackers. It's all here – your only problem is going to be how to fit it all in. Remote, mysterious and eerie are all words which have been used to describe the Forgotten World Highway landscape which paints a real-life picture of extreme human endeavour and fascinating heritage. The Taumarunui to Stratford route follows old Maori trails, bridleways and the decommissioned Stratford to Okahukura railway line. Travelling through tunnels, crossing bridges and viaducts, wriggling over mountain saddles, journeying past old abandoned railway buildings left by the original pioneers and discovering relics and historical leftovers by the score, this journey is a memorable one. You can drive the route but the more fun options include self-drive rail carts or rail bikes which run along the old rail line. If you want to inject a bit more adrenalin into your journey you can combine this with a spot of jet-boating. Resonating with native bird song and crowded with centuries-old trees, the geologically unusual Te Apiti – Manawatu Gorge and its forests is just a short hop from the urban mass of Palmerston North. There are a choice of tramps here which include the easy 30 minute Loop Track, the 2 hour Tawa Loop Walk and the 4 hour one way Gorge Track which has some stunning viewpoints to enjoy and even some swimming spots. If native flora and fauna interest you be sure to download the Manawatu Gorge biodiversity brochure from the Department of Conservation website – and don’t miss the Maori warrior sculpture tucked away here. However, if you'll be happy with nothing less than full ocean immersion both snorkelling and diving opportunities are also possible to get a full-on view of what is happening beneath the marine park's waters. The Sugar Loaf Islands sit just off New Plymouth's coast and, like so many places in this part of the world, its name came courtesy of Captain Cook. A collection of small uninhabited islands and rock stacks are all that remains of what is believed to be an extremely ancient ruined volcano. This marine reserve is bursting at the seams with marine life which includes more fish species than you can count, a host of sea-birds, playful seals and both whales and dolphins. Hop on-board a boat tour to take an island circuit or take a guided kayak tour to get a little closer to the action still. There are tons of companies who are happy to offer all kinds of activities in and around this area which include horse riding, jet-boating, kayaking, white-water rafting, fishing and guided adventure hikes of varying durations with overnight camping. The Taranaki's region fertile volcanic soil and healthy mix of rain and sun make for a perfect growing environment so if you're into your flora you're in for a treat here. So diverse and plentiful is the plant-life found here, Taranaki has been dubbed the 'Garden of New Zealand' and it has tons to boast about. Both formal and wilderness gardens can be found in great numbers – some are pocket-size while others cover vast areas. And not only are there lots of them but some of them have an historical and cultural significance too, having been here since the earliest pioneering times. Have a wander around the inner-city 'Garden of International Significance' - Te Kainga Mariri or the rhododendron masses in Pukeiti Rainforest which nestles at the foothills of Mount Taranaki. The 49 hectare Pukekura Park is worth a visit anytime with its native bush sections, waterways, water features and look-out points but it also acts as a highly scenic venue for a variety of concerts, events and festivals with its natural amphitheatre. These include the iconic annual WOMAD music, arts and dance festival, the stunningly beautiful Festival of Lights and occasional big-name music events. Grab a 'Parks and Gardens' booklet from tourist offices to get more information. Not content with the usual white-knuckle alternatives for thrill-seekers, Taranaki has come up with dam dropping. Perfect for all those whose idea of fun is balancing precariously on a body-board or kayak around 9 metres up, at the top of a wall of water cascading over a hydro-dam, before launching themselves over the edge to ride the frothing, racing water. If you want to add this one to your 'been there-done that' list you'll need to head to the Taranaki region because right now this particular mode of adrenalin injection is only possible in a handful of places – all of them Taranaki located. Coastal New Plymouth is a kind of happening place for the young and artsy with a wealth of attractions which range from the mainstream but iconic to the underground and up-to-the-minute. Art galleries – including pop-up versions and the quirky Govett-Brewster - gigs, museums and a packed cultural calendar of free events along with some great bars and clubs make this town a backpacker favourite. Check out the Pop Up Gigs Network on Facebook to see what's what while you are in town and if you are intent on some after-dark party-flavoured shenanigans Devon Street is the place to head. For those in search of some lazy beach time there are a few choices - the surf-passionate tend to head to Fitzroy Beach – while inland tranquillity can be found in a host of gardens that come in varieties which include the fantastic, formal and fun. Especially lovely is Pukekura Park with its packed calendar of live performances. The Goblin Forest in Egmont National Park is not actually named for any LOTR connection – having been here long before Peter Jackson and co decided to make this beautiful country 'Middle Earth'. Having said that, all those who venture into this highly magical place will feel they have just walked onto a fantasy film set and even those least inclined to fanciful notions might start visualising a fairy or two. Trunks and branches which wind and twist around each other are formed because the kamahi trees (of which this place is mostly made up) make their start in life by hitch-hiking on other trees. The whole drips with hanging ferns and mosses and the forest floor itself is swathed in an emerald-green moss carpet. The result – an enchanted fairytale forest. Just to enhance the fantasy theme, there are a series of beautiful (but chilly) natural pools called Wilkies Pools here. 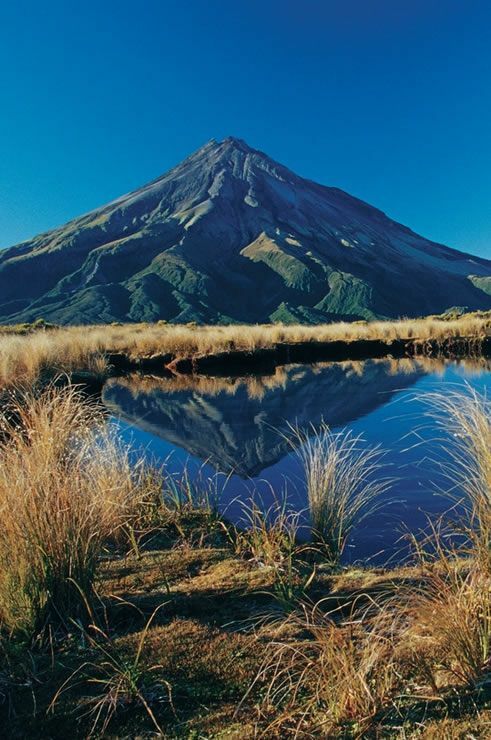 Otherwise Egmont National Park – dominated at its centre by the almost perfectly conical Mt Taranaki volcano - is a playground for the out-doorsy type with a host of hiking, mountaineering, climbing, biking and skiing opportunities on offer. Challenges at the more extreme end of things include an ascent of Mt Taranaki itself or the 25 km Pouakai Circuit, while those who want to breath the fresh air without over-stretching themselves can pack a picnic and simply walk a few minutes to reach waterfalls such as Bells Falls or Dawson Falls and other oh-so-lovely spots. Wet and wild or floaty and serenely scenic – this region has a little of everything when it comes to river activities and a lot of it in the middle-of-nowhere category. Get paddling and among some stunning scenery with a kayak or canoe trip – plenty on offer on the Whanganui River - which could last hours or days. Or you can amp up the thrills with some white-water rafting on the Rangitikei or Ngaruroro River which themselves offer a variety of choice for all comers - from gentle float trips to Grade 5 gut-wrenching challenges. 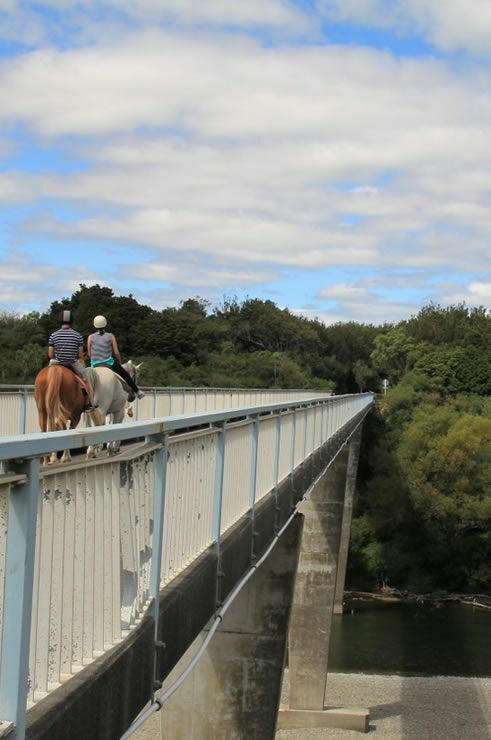 The high-adrenalin intent might also be interested to know that the Rangitikei River is home to the country's highest bridge bungee jump as well as a canyon swing and extreme flying fox located in the lovely river gorge. Another river focused adventure option in this region is a high speed jet-boat journey while there are any number of combos for those who are having trouble deciding quite what to pick from the vast menu of fun choices. Official Tourism Website - Taranki - Everything you need to know about Taranaki! Official Tourism Website - Whanganui - Everything you need to know about Whanganui! 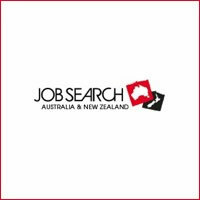 Official Tourism Website - Manawatu - Everything you need to know about Manawatu!